March has arrived! I cannot believe that it is already the third month of the year, although I am happy to bid farewell to February. What a crazy month it was. From frigid temperatures to top-down-driving-with-your-hair-on-fire sunshine splashed warmth to close out the month. I regret that I was not able to get in a round of golf during the month, although yesterday I did make it to the practice range for a few bucket to begin trying to get my swing in shape before next week's golf trip to Florida. I was surprised that the range was empty. I even found a rare left-handed tee box right in the front of the entry instead of having to go all the way to one end. 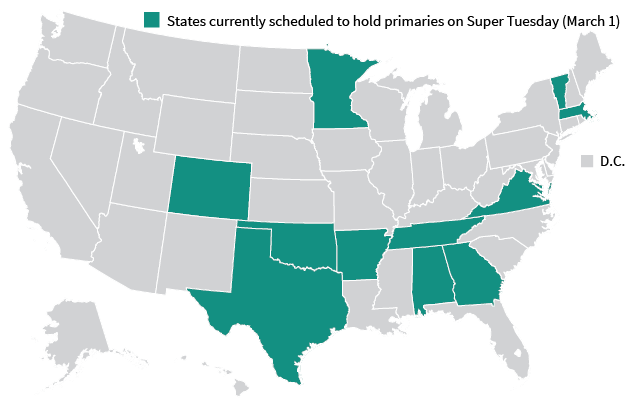 But on to today--it is Super Tuesday. I'm not sure why they decided to call today's primary extravaganza "Super" and not "Insane" or something like that, but I already know what will dominate the news. I wished I lived in a state that was holding its primary today and that way it would all be over except the shouting. I am not going to make a prediction about the outcome of today's primary voting except to say that I believe one clear candidate will emerge for each party and that the rest of the primaries will be dedicated to confirming that candidates ability to win the primary on the first vote during this summer's conventions. I remain disappointed over the media coverage and the debates.I do not believe that the American people get to adequately examine all of the candidates when the media coverage is provided commensurate with the shock effect of the individual candidates. In my estimation, each of the top five candidates (3 Republican and 2 Democrat) have significant deficits which make them less than optimal choices to be President. It is time to choose! I wish I could go golfing.